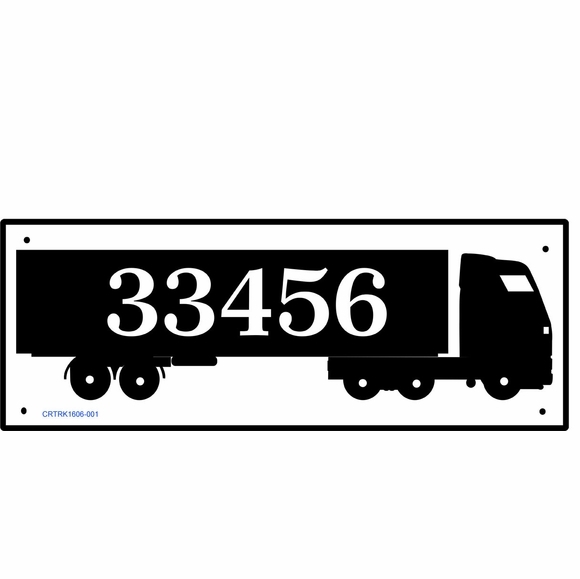 Personalized Truck Shape Street Number Plaque - - over the road semi-rig shape. Almost but not quite an 18-wheeler. Made in USA. 16" x 6" truck sign for your home or business. Wall mount. Special shape. Note: the style number on the sample truck is for internal use only and not part of your custom sign. Customized with your choice of color and address number you specify. Dimensions: 16"W x 6"H x 1/8". Truck shape personalized address sign crafted in the USA. Click the first three links in Related Products to see more special shape novelty signs.